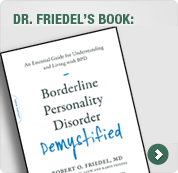 There are two types of treatment of BPD – medications and psychotherapy. The risk factors for developing BPD are genetic (the average heritability of BPD is 60%) and environmental (40%). Therefore, treatment is usually most effective when both medications and psychotherapy are used simultaneously. The Three Phase Model describes the combined use of medications and psychotherapy in BPD as treatment progresses. The model spans the course of treatment from beginning to recovery and defines how the relative emphasis of medications and psychotherapy changes during treatment. It provides patients and their families with a roadmap that enables them to better understand the goals and tasks of treatment: those at hand; the ones ahead; and those accomplished if treatment has already begun. Phase 1. Medications are the first line of treatment for many of the core symptoms of BPD and for co-occurring disorders such as ADHD and major depressive episodes. The most effective medications for you are determined mainly by your primary symptoms and by your specific biological makeup. Significant benefit from treatment with medications can often occur within a few weeks and a stable regimen can often be achieved in two to three months. In this phase of treatment, psychotherapy begins and focuses on critical, initial objectives by using general methods that are common to most types of BPD-specific therapy. Phase 2. In Phase 2, the general and specific methods of psychotherapy best suited to your individual needs become the primary focus of treatment. Medications continue to be used, but assume a secondary role to psychotherapy, although their doses may be fine-tuned to meet your changing needs. For many patients, this phase of treatment ranges from one to two years in duration. Phase 3. The concluding phase of treatment focuses on consolidating the gains made in the initial two phases. As treatment with medications and psychotherapy progress, it is not uncommon to observe that many patients require lower doses of and fewer medications. Eventually, some patients may not require medications at all, except during times of unusual stress, or for the treatment of chronic, co-occurring disorders. Late in Phase 3, as you become more skilled and self-sufficient, the frequency of psychotherapy also declines. Ultimately, therapy is only used as needed during periods of crises or significant life-changes. To best understand the interaction of these two types of treatment, it is important to know some facts about each. Medications: Two classes of medications have been shown to be most effective in reducing some of the main symptoms of BPD. First, certain mood stabilizers, especially topiramate (Topamax) and lamotrigine (Lamictal), significantly reduce symptoms of impulsivity, anger, anxiety, depressed mood, and general level of functioning. The second class of medicines, antipsychotic agents, are used primarily for bipolar disorder and schizophrenia. However, they are also useful for other disorders such as depression and BPD. When suspiciousness, split-thinking, dissociative episodes or paranoia are prominent in BPD, and persist after other symptoms improve with mood stabilizers, the addition of such an agent is indicated. The medication aripiprazole (Abilify) has been found to be particularly useful in BPD in recent studies. Medications reduce the severity of your symptoms to a level that will enable you to engage in and benefit most from psychotherapy. Psychotherapy: There are at least six types of psychotherapy for BPD: 1) Dialectical Behavior Therapy (DBT); 2) Mentalization-Based Therapy (MBT); 3) Transference-Focused Psychotherapy (TFP); 4) Schema-Focused Therapy (SFT); 5) Interpersonal Therapy (IPT); and 6) Systems Training for Emotional Predictability and Problem Solving (STEPPS). Most forms of psychotherapy for borderline disorder share common methods that are useful early in the process, and use specific techniques that may be selected to meet your special needs as therapy continues. An important challenge in treatment is to determine the most effective way to use medications and therapy together to achieve the best results possible.